The “Troika of Doom”, the European Central Bank, the European Union, and the International Monetary Fund (IMF) Sign A Deal With the President of Cyprus Nicos Anastasiades. 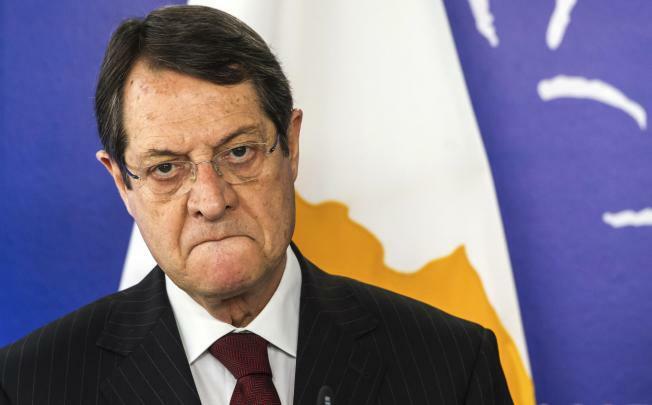 The bullies of the so-called “Troika” have signed a piece of paper that they are calling an “agreement” with the new rightist President of Cyprus, Nicos Anastasiades that reorganizes the banking system of Cyprus. The Cypriot Parliament was totally shut out of the process – the voice of the peoples’ representatives silenced and ignored in one of the most heavy-handed operations yet mounted by the European banks and Bilderberg ruling class. And in one of the most cynical statements made yet this year, Daniel Gros, from the Centre for European Policy Studies, in an interview with Euronews, said that “It was necessary to have some theatre”, letting the Cypriot Parliament to say “no” to the first bailout offer. Then a second deal was signed by the President with the “Troika”, with no vote from the Parliament at all. This is a cynical admission that the entire process is being stage-managed by the euro banksters. The deal as forced on Cyprus is the most onerous that can be imagined for the middle class, the poor, and small business, as well as some of the wealthy and foreign investors. 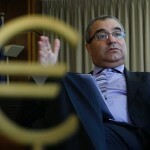 The “Troika” has seized the Second largest bank in Cyprus, the popular Laiki Bank, and divided it into 2 parts, a “good bank” where all deposits under euro 100,000 were transferred and will be given to the remaining Bank of Cyprus, and a “bad bank” which will carry all the debt and derivitives, plus all the accounts that have over euro 100,000. The depositors who have money in the “bad bank” will be subject to a loss of their funds of up to 40% of their accounts. ECB appointed Bank Gov. Panicos Demetriades, who is also on the ECB board, said that the funds transferred to the “bad bank” will be used to pay off bad debt. In addition, the bond-holders of the Laiki Bank will likely suffer a 100% loss and the bond-holders of the Bank of Cyprus will also take a heavy loss. The fresh fruit and vegetable markets have dropped 50% in sales. A Euronews video reported that the poor people have been hit hard, now only affording to buy potatoes, just the basics. The banks were completely shut down on March 16th, throwing the population into chaos, with no money to buy anything. On Sunday, March 24th, currency controls allowed a withdrawal of only 100 euros per day. Not only have mass demonstrations rocked the island, but the employees of the now closed Laiki Bank tried to storm the bank. Police kept the employees out by using force. These employees will now be out of work permanently. In a recent interview, Eurogroup Chief Jeroen Dijsselbloem, said that Cyprus is being used as a “model” for future operations of the ECB that might be put on to other countries, probably referring to the problems of the “P.I.G.” nations. This admission caused an uproar in the E.U. as the ruling elites were upset that the Eurogroup Chief had let the cat out of the bag, so to speak. With the collapse of the financial system, Cyprus now faces a rolling crises, poverty, unemployment, business failure, and a total dissolution of trust in the banking system. Now the entire world knows that their deposits in any bank can evaporate in an instant. Likewise the investors in the banks themselves, the shareholders and bondholders can easily be hung out to dry by the big Central Banks. Meanwhile, the Wall Street derivatives peddlers who caused all this get off scot free. As the global economic crisis—now in its sixth year—drags on, the rich and powerful are still sticking with the same old formula: Do whatever is necessary to save the banks and make poor and working people pay, one way or another. In recent days, a looming financial collapse in the Eastern Mediterranean island country of Cyprus emerged as the latest flashpoint. In February 2012, a second bailout for Greece included a partial default of the country’s debt, called—euphemistically—a “haircut” and also “private sector involvement.” This was supposed to help make the debt sustainable and avert Greece’s exit from the Eurozone, which would likely have far worse consequences for the finance capitalists involved in the deal. Last year’s default imposed major losses on Cyprus’s biggest banks, which had used large amounts of its depositors’ money to “invest” in Greek bonds. Cyprus then became the fifth country in the Eurozone—the 17 countries that use the euro currency—to seek international assistance for bailing out its banks. The bailout money required—eventually amounting to 10 billion euros (about $13 billion)—was to be provided by the “troika”—a bloc composed of the International Monetary Fund, European Central Bank and European Union. Cyprus—outside of the Turkish-controlled northern section of the island—has close political, economic and cultural ties with Greece, almost to the point of being a protectorate. The Cypriot banking sector has been teetering on the verge of collapse ever since the effects of the partial default began to be felt. The fear among the rulers of Europe is that this would cause a full sovereign default and force Cyprus out of the Eurozone, a politically unprecedented development that would have potentially devastating ripple effects. Cyprus, with a population of roughly 1 million, is among the smallest countries to use the common currency. Since 2009, the Eurozone has been consumed by what has been termed a “debt crisis” that has sent unemployment rates, poverty and general misery skyrocketing across Europe. Although the corporate media portrays the situation as a consequence of out-of-control social spending, the Eurozone is suffering from the generalized effects of the world crisis of capitalism exacerbated by high levels of government borrowing, financial speculation on that debt and the highly uneven development of member states. From 2008 until the end of February, Cyprus was led by President Dimitris Christofias of the Progressive Party of Working People (AKEL). Although AKEL refers to itself as a communist party—Christofias himself received his doctorate in the Soviet Union—it has adopted a bourgeois electoral and parliamentary approach to dealing with the island nation’s debt crisis. Christofias put through three austerity packages but was unwilling to accept the troika’s terms for a bailout deal. Nicos Anastasiades of the right-wing Democratic Rally party promised in the lead-up to the February election to negotiate an acceptable deal with the troika. This enabled him to beat the AKEL candidate and become the new president of Cyprus. Anastasiades signaled his intention to finalize a bailout deal as soon as possible and immediately began intensive negotiations. Last week, Anastasiades announced that he had reached a jarring agreement with the troika. In return for the troika’s bailout money, Cyprus would have to conduct a “bail-in” and seize 6.7 to 9.9 percent of all bank deposits in the country to raise 5.8 billion euros (about $7.5 billion). Doing away with the veneer of “competitiveness,” “restructuring” and “fiscal adjustment” that other austerity measures have been cloaked in, the troika proposed outright theft that would be felt most by poor and working people. However, the prospect of such blatant robbery was rejected by virtually all sections of Cypriot society. The working class was outraged that what little savings they had managed to scrape together would be diminished to pay for the capitalists’ crisis. But the ruling class in Cyprus also feared losing their recognition as a tax haven for offshore millionaires and billionaires—a cornerstone of the Cypriot economy. The parliament of Cyprus bowed to this near-unanimous domestic pressure and refused to endorse the plan—President Anastasiades’ deputies abstained and every other lawmaker voted no. The crisis reached its peak as the country’s banks were closed to prevent massive withdrawals and capital flight. The government of Cyprus, scrambling to avert a default and Eurozone exit, pursued a multifaceted bargaining strategy in an attempt to force the troika to soften its demands. It proposed stealing pension funds and publicly owned state assets to create an outrageously named “solidarity fund,” which would also include assets from the Church of Cyprus. This was supposed to raise the 5.8 billion euros required by the troika and render the “bail-in” unnecessary. The Cypriot government also attempted to leverage the hundreds of billions of cubic meters of natural gas recently discovered in the waters south of the island nation. It was prepared to offer large stakes in future gas production to capitalists willing to immediately put up the money. 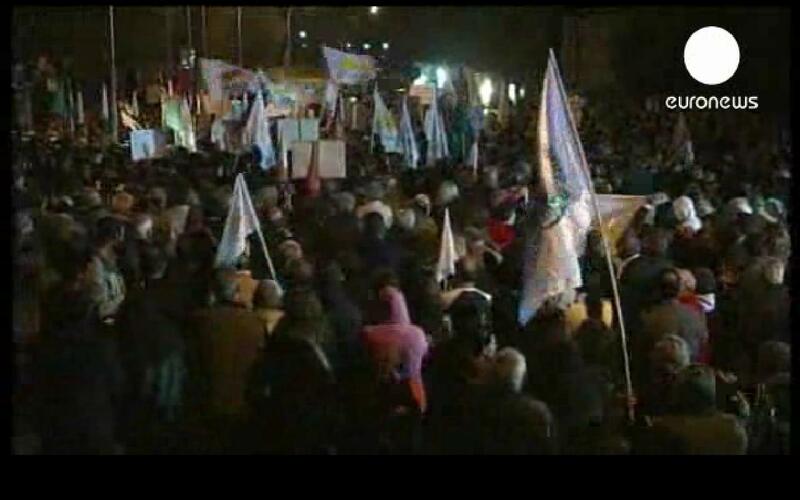 Many portrayed the sale of gas reserves, which rightfully belong to the Cypriot people, as Cyprus’s ace in the hole. However, there are several problems that made this proposal ultimately untenable. First of all, the necessary infrastructure—which would cost at least $36 billion—would not be in place until at least 2018 to begin production. At that point, the market will likely be flooded with gas from the United States, Australia and parts of Africa, largely due to the explosion in the practice of hydraulic fracturing or “fracking.” Finally, Turkey, which has effectively controlled Northern Cyprus since a war in 1974, is likely to launch an immediate and aggressive legal challenge to the South’s right to exploit the gas reserves. President Anastasiades hoped to play Russia and the European Union against each other to strengthen his own bargaining position, weakening the troika by exploring the possibility of a Russian-financed bailout. Politically, President Anastasiades hoped to play Russia and the European Union against each other to strengthen his own bargaining position, weakening the troika by exploring the possibility of a Russian-financed bailout. These two world powers have conflicting geo-strategic interests, finding themselves on opposite sides of major developments like the civil war in Syria and NATO’s “defensive” missile shield in Eastern Europe. Russia sees in the Eurozone debt crisis an opportunity to expand its influence. It already extended a $3.3 billion loan to Cyprus in 2011, and Russian state energy company Gazprom has made moves to acquire the Greek national gas company DEPA, which is, ironically, slated for privatization under orders from the troika. The Russian government nevertheless continues to take a politically assertive stance, warning the troika that it may swap a part of its foreign reserves held in euros for another currency. 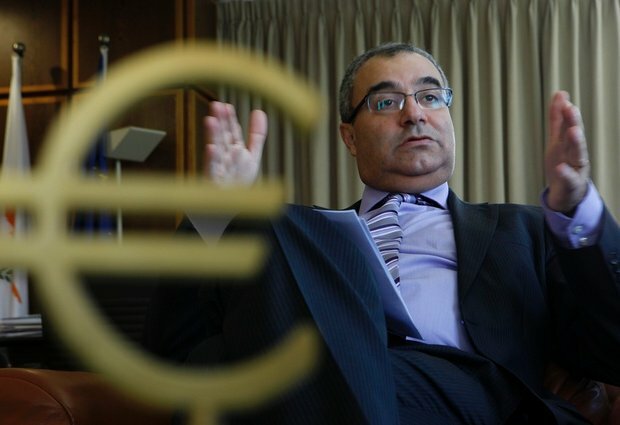 With the European Central Bank threatening to cut off massive cash infusions, called Emergency Liquidity Assistance, the Cypriot president turned back to the troika for the desperately needed bailout money and finally reached a deal on March 25. The “bail-in” deposit tax was retained in the final version but in a modified form- affecting up to 40% of deposits of more than 100,000 euros (about $128,000). While this may seem like a pro-worker decision, it simply sets the stage for the kind of devastating attacks on the rights of poor and working people in Cyprus that have already been seen across Europe. The capitalist rulers of the Eurozone also seem to have wanted to punish Russia for meddling in its sphere of influence. Under the deal, the second largest Cypriot bank, Laiki, is to be dissolved and split into a “good” bank composed of its profitable assets and a “bad” bank made up of its nonperforming investments. The “good” bank is to be absorbed by the country’s largest bank, Bank of Cyprus, which will now enjoy nearly unchallenged monopoly status—further proving the Marxist assertion that capital consolidation intensifies during periods of economic crisis. As capitalist politicians use the livelihoods of poor and working people in Cyprus as bargaining chips, the only available avenue for struggle is militant, persistent and organized mass action. 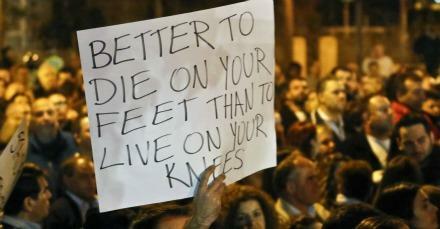 The rulers of the Eurozone hold all the cards at the negotiating table, but the people have the power in the streets. Check out LiberationNews.org for more articles on the E.U. crises and other financial topics. Collapse of the E.U. Beginning? 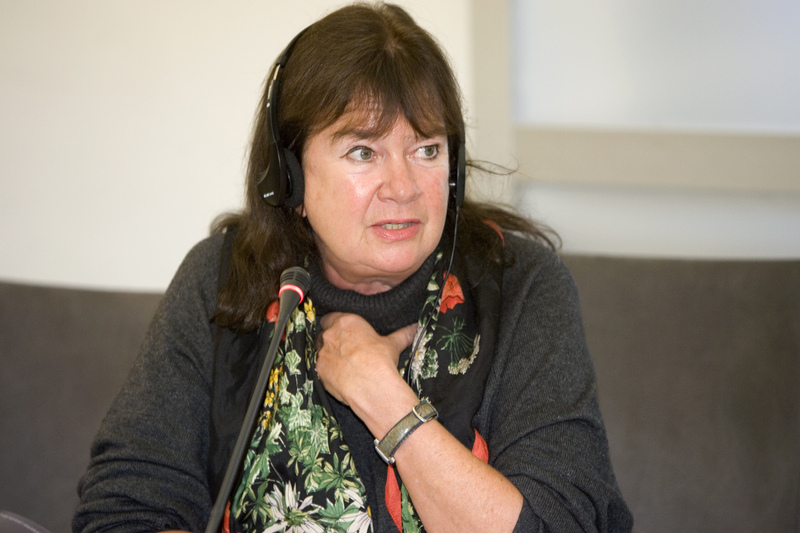 Helga Zepp-LaRouche Warns of Chain-Reaction Collapse of the E.U. and Hyper-Inflation. Run On E.U. Banks May Be Next as UK Pensioners Told To Pull Their Funds From E.U. Banks as Currency Controls Loom. Helga Zepp-LaRouche, in an Emergency International Webcast warned that the crisis in Cyprus is threatening to unravel the entire European Union. She also considers the possibility that this crisis is being created to lead Europe into a “Political Dictatorship” by collapsing the Euro and forcing the people of the European nations into a dictatorship. The present “bank robbery” of the accounts of the average citizens who are asked to take a so-called “hair cut”, meaning that the Central Bank wants to steal 6.75% of their bank funds, is really nothing more than one of the largest bank robberies in history, committed by the European Central Bank and their plutocratic owners. Even more money would be stolen from larger accounts over $100,000. These would be hit with almost 10%. It is interesting to note that Cyprus is a place where many grey area depositors have money stashed. Rumors abound that both the Russian and Israeli mobs have millions in bank deposits there. It is also rumored that various mafias from the Middle East, Lebanon, Palestine, and France use Cypriot banks. Are these folks going to stand for a “shakedown” by the even bigger mafia – the European Central Bank – Rothschild Axis? Or will there be hell to pay for this act? The Russian, Israeli, Lebanese, and other mobs could easily begin a “pay back” for this treachery. If you see the strangled bodies of E.U. bankers floating down the Seine, you will know that the biggest mob war in modern history has begun. In addition, any “currency controls”, meaning that depositors will be limited in their ability to withdraw the full amount of funds from their own accounts, will also trigger a complete loss of faith in the E.U. banking system. Indeed, it may already be too late to stem the loss of faith in the system. According to Zepp-LaRouche, the British government has warned its citizens living overseas in European countries to withdraw their pension funds since looming currency controls, bank closures, and bank “holidays” may limit their access to their own funds needed to pay rent, eat, and otherwise survive. About ten years ago I was living camped out in a back add-on building, called the ‘chapel’, of two story old house in the edge of Hancock Park, actually on the border of Korea Town, when the house was sold and I had no clear vision as to where to go. With my brother’s brainstorming help, I decided to put all of my somewhat gypsy belongings into a storage locker right off a main freeway in downtown LA…but still didn’t know what I was going to do next. At the time I had my own business teaching, well, actually tutoring, doing educational therapy with kids of all ages with learning differences. My weekdays varied. I worked with my students, after school, at their homes, and in all different areas of the city, On a weekly basis I would drive from Malibu to Silver Lake, from Glendale to near LAX. to tutor academically and emotionally challenged children of mostly above average income parents. Since I had been doing this work for some years I didn’t mind driving and actually grew to feel like a taxi driver, knowing all of the short cuts and shops everywhere. I felt at home in all of the different areas of LA. My varied friends were also scattered throughout the city and the expanded metropolis. When my friends heard of my new lifestyle they wanted to be supportive and to my surprise offered me the keys to their houses. Since most had a spare bedroom they were happy to have me crash at their houses one night a week. On the weekends I would visit my storage locker in order to get a change of clothes and different educational material that I needed for the week. I had part of the storage locker set up like a bedroom with chest of drawers highly organized into categories of clothes and racks of shirts,sweaters, pants and skirts from which to choose. When I finished tutoring sometimes the parents would invite me to stay for dinner. In addition I soon discovered how to eat simply out of grocery stores and that McDonalds had the best chicken salad of all the fast food places. At that point I wasn’t fussy in my eating habits. After tutoring I would call my friends who lived in the area in which I was working and ask if I could spend the night at their house. Their answers were always an excited, “Yes, you have your key, just let yourself in and I will be back from ‘wherever’ soon.” Sometime they would welcome my company for a delicious dinner that they had fixed or an impromptu dinner that we co-created. I was able then to visit my friends at night and in the morning, and quality time too. Invariably they had problems in their lives and they welcomed my counseling expertise. They seemed to at least listen to my input and It felt good for me to be able to help them. I had known that I liked spontaneous living and that the word ‘plan’ wasn’t really part of my vocabulary, but existing in this ‘free-spirit’ way showed me just how content I was to simply be ok with what was. Actually the whole thing was more liberating and satisfying than I could have imagined. Well really, I did not go into the future enough to imagine anything. I didn’t do any planning, other than my students, and just went from doing one thing to the next. Since I love short trips and people, this life style suited me well. I learned a lot from my constant interaction with people…and that hiding within myself, in my room, wasn’t the most productive for me. I was amazed at how my self confidence and self esteem grew, just realizing that I was flexible enough to fit in anywhere. People seemed to value not only my counseling and people skills but my astrological knowledge as well. Everyone wanted me to look at their charts. This experience was so positive I would love to do it again. Unfortunately, I now live in a cottage in Santa Monica that has rent control. and I am afraid to give up this low rent to venture into the unknown. Since I have temporarily abandon my nomadic ways and collected a cottage and a garage full of ‘tools of the trade’ and semi ’emotionally attached to’ precious possessions, I will continue to hope that someone reading this will be able to help me get unstuck. Suggestions and comments are most welcome. Homeless Dinner at Memorial Park, 85 East Holly St., Pasadena. Starts at 12:30pm – 6pm. Could This Happen Here? The E.U. Wants To Take Money Out of Depositor’s Accounts Without Their Permission! These Are Thieving Banksters Who Should Be Escorted To The Nearest Prison. If these worries become really serious, . . . [s]mall savers will take their money out of banks and resort to household safes and a shotgun. The deposit confiscation scheme has long been in the making. 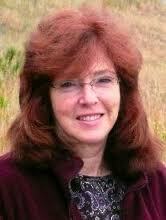 US depositors could be next . . . .
Click here for Ellen Brown’s web site.